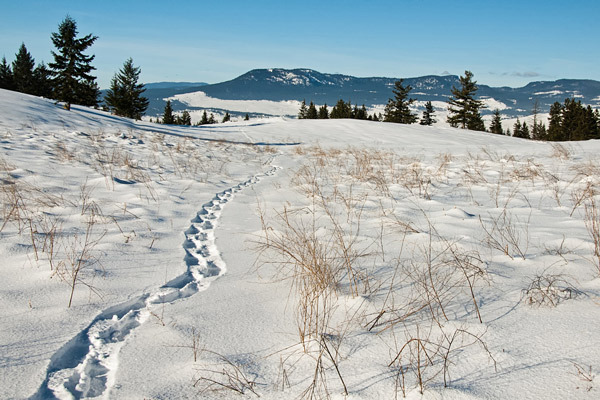 Almost a year ago to the day I wrote that I looked forward to enough snow-pack on the hills to snowshoe in, and as then, after a morning of shoveling a deep path to my chicken coops, clearing the driveway, and another path to the front porch, I was again taking my first winter hike up to the high meadow above my home. Last year my January walk up into the meadow’s deep snow was on a sunless, stormy day. And I recall setting a high ISO so I could get a shutterspeed that would let me handhold my camera, and then returning home in a snowstorm. This time I mounted a light-weight, 18-105mm lens on my camera, stuck an old tea towel in my pocket in case I got my camera wet from the snow, and headed out in the balmy minus 3C day under a bright, almost-cloudless, blue sky. And instead of struggling with low, flat light, my ISO was set at 400; and I added a polarizing filter to darken the skies, increase the contrast in the scene, and suppress glare from the surface of the bright white snow. I trekked up the hill, and as I had so many times before photographed everything. When I stroll up into that long meadow I rarely see animals, however, they are surely there hiding, and I did hear a snort from something as it moved through the trees, and when I began to cross the meadow a crow cried a warning to hidden watchers, then everything quieted, and the only sound was from my snowshoes and my camera shutter as I photographed the Thompson River valley far below and the tracks I made through the meadow. My last article was entitled, “What Makes Photographers Happy?” Photographers wrote me noting that, “there is nothing like a new lens” or “fun day with my clients”, and I can’t agree more. I must include the words of three bloggers that sent their comments to me: Northern Desert photography, Nature Photography by Martin Ryer and Jane Lurie Photography. What great thoughts on photographic happiness and I agree with everyone. As for me, I will include the following from philosopher and theologian, Paul Tillich, who wrote, ” Language…has created the word ‘loneliness’ to express the pain of being alone. 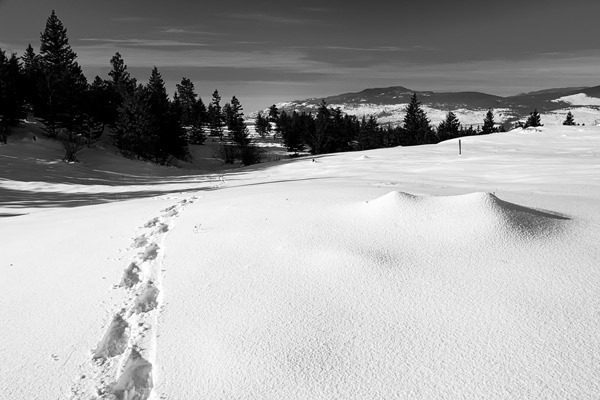 And it has created the word ‘solitude ‘ to express the glory of being alone.” To those words I will add that my quiet, solitary walk and photo excursion on snowshoes made me happy. 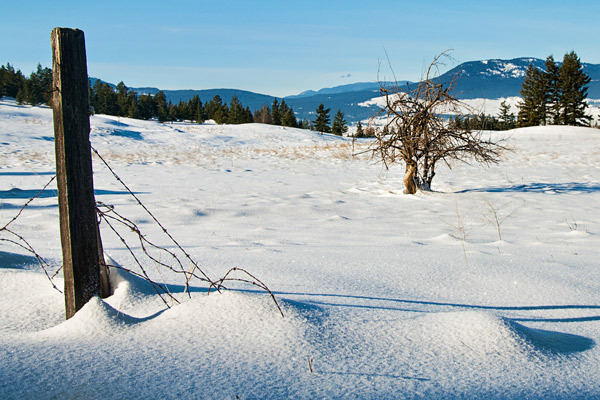 This entry was posted in Photography and tagged 18-105mm, digital cameras, DSLR, forgotten barn, Jane Lurie Photography, John Enman, kamloops, landscape, Nature Photography by Martin Ryer, Northern Desert photography, Paul Tillich, photographer, polarizing filter, snow winter, Snowshoes, Thompson River, tracks, walk on snowshoes, windswept field. Bookmark the permalink. Wonderful shots and commentary on happiness and photography, John. Very kind of you to include my thoughts in your post. Thank you. And thank you Jane. I enjoy your insight. Lovely shots and words, though I live in the north all the snow here has fallen below across the middle of the country, and thats happened for the last 3 yrs now, i do miss the photo ops of it. 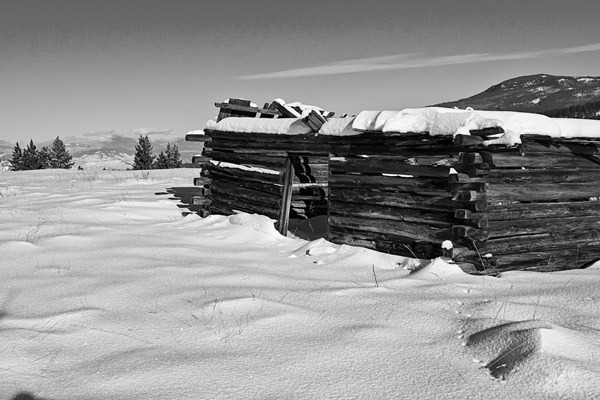 I wondered if you got snow where you wander with your camera frag. I like the snow. Well, most of the time anyway.